The Cherubini 48 staysail schooner designed by John Cherubini is just one of those amazing yachts that you can’t stop starring at. She is stunningly beautiful exactly as in your heart you just instinctively know that she is exactly perfect. Just like a sailing yacht should look; the Cherubini 48 is long and graceful with a beautiful shiply clipper bow sweeping back with a graceful sheer. 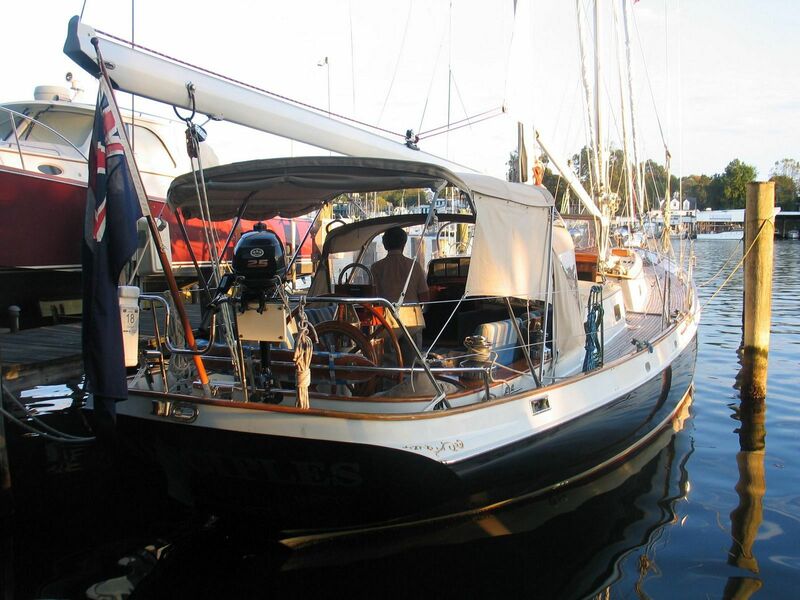 With her low freeboard and handsome transom with derives from the original Grand Banks fishing schooners and racing schooners of the 30’s. 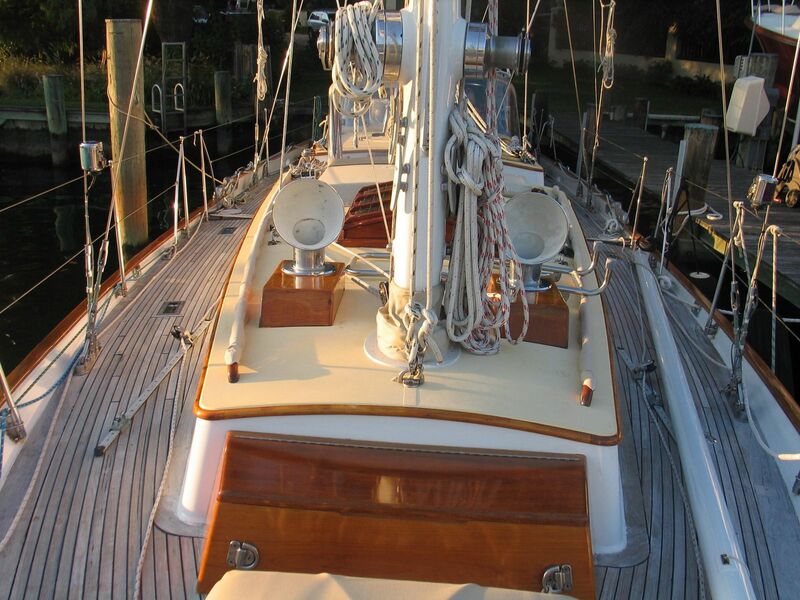 She is built to impeccable standards to be a modern classic yacht. Cherubini Yachts has long been recognized as a builder known for exquisite detail and uncompromising standards. 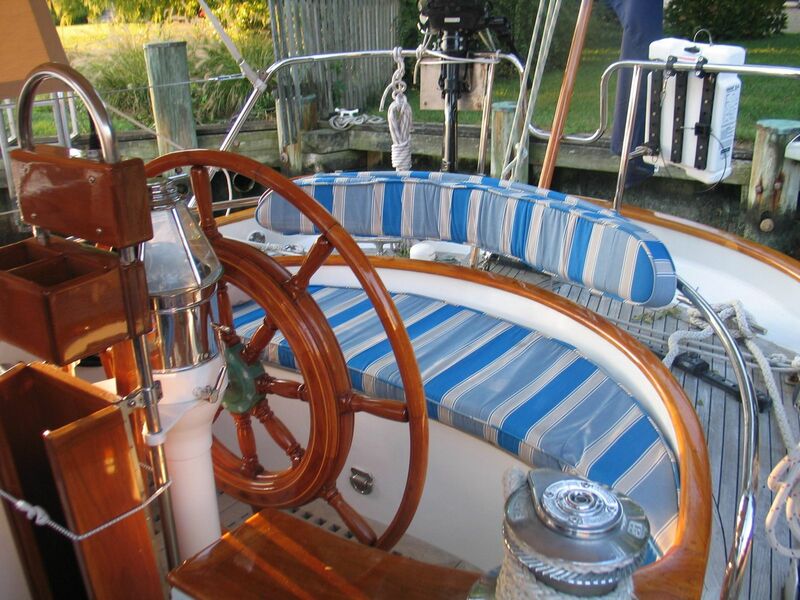 She looks like a classic yacht of the 1930s, but she is built using modern materials and strong solid fiberglass construction. 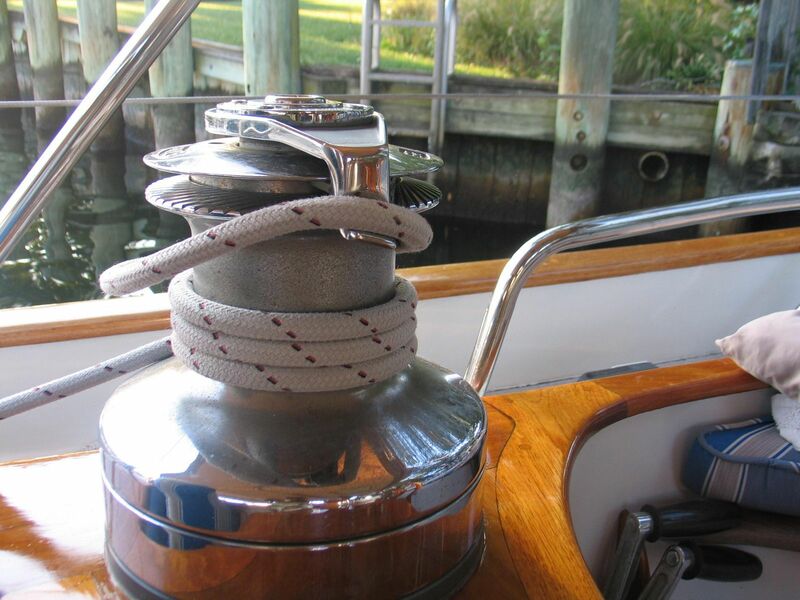 The hull is immensely strong with woven roving layup about a ½ inch thick at the bulwark to 1 1/2 inches thick at the keel. 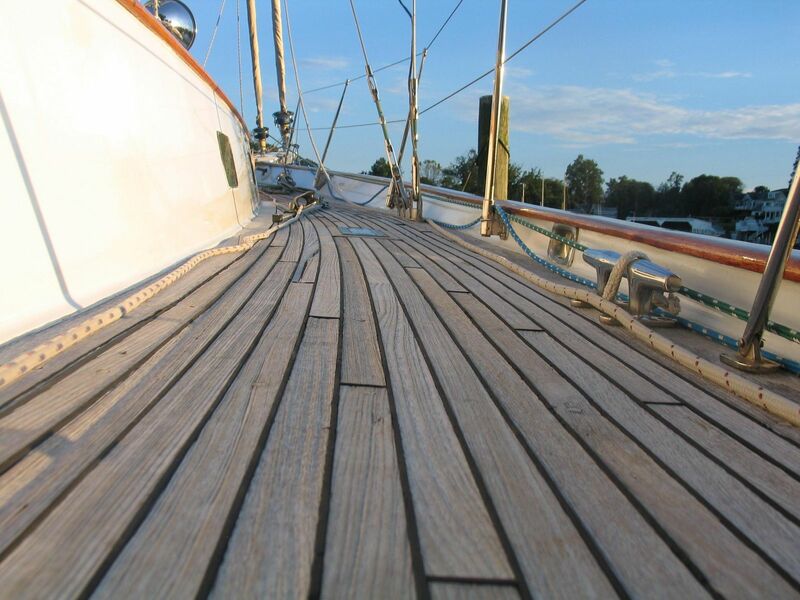 The yachts are often customized by the first owner and in this can Principles, as she is called, was ordered with carbon fiber masts, and rod rigging with Schooner racing in her future! Modern construction and classic finish; Finish in the colors I might add. A principle has an impressive race record! 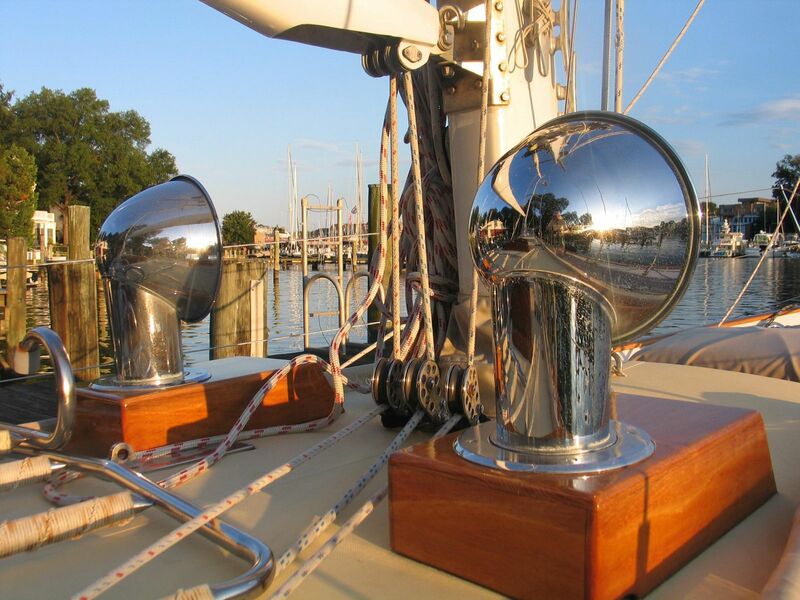 The hand-finished teak gleams and is set off with the custom stainless steel and bronze fittings and ports. Everything is put together with the latest construction methods and materials. 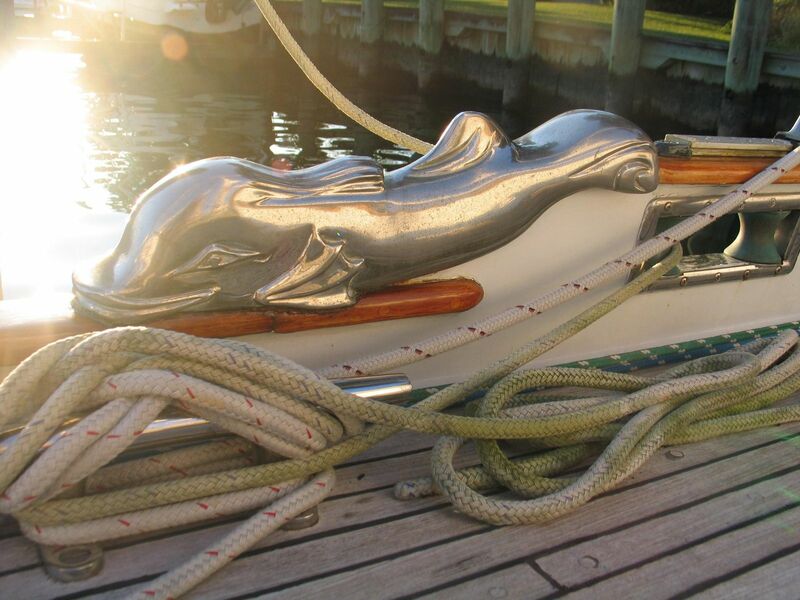 She is robustly built to the demands of the ocean and she is finished to flawless perfection. 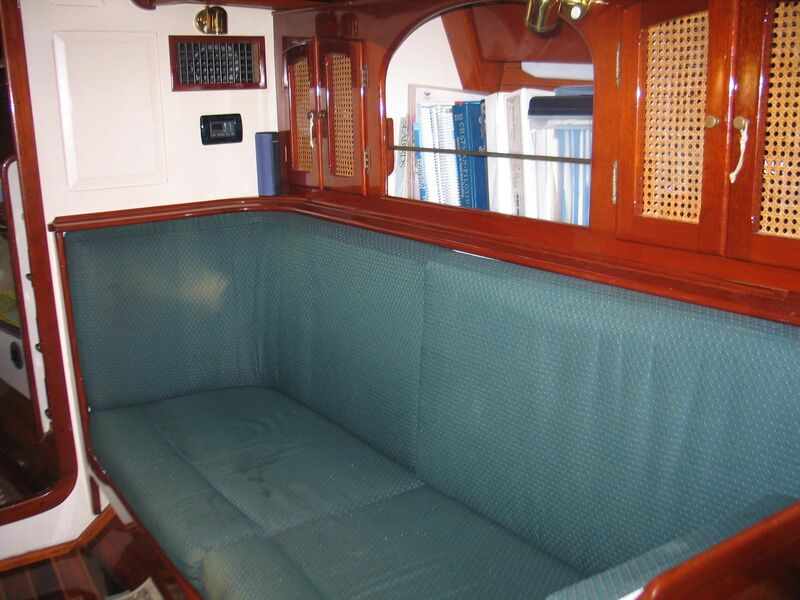 Below deck you are transplanted to a time when elegance was the standard to which a yacht was held. 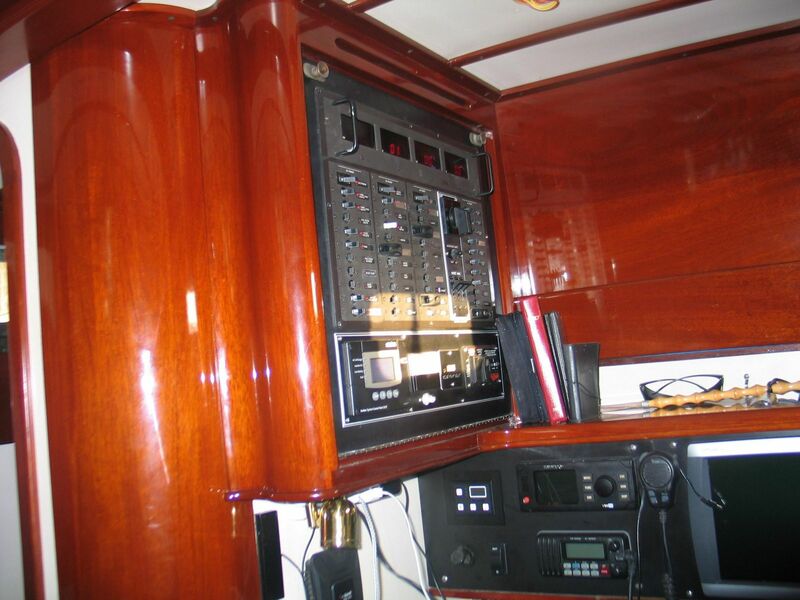 The teak wood is sumptuous and the joinery is superb. She is finished down below to the same high standards of quality with the richness of classical elegance. 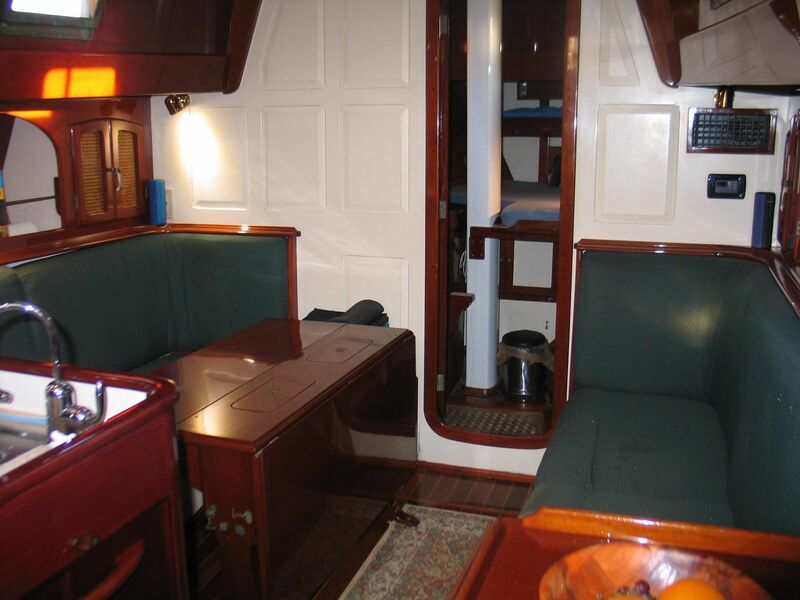 The layout is perfectly designed for a cruising couple with occasional guests. And also know that Cherubini Yachts is still in the family operating still after four generations! 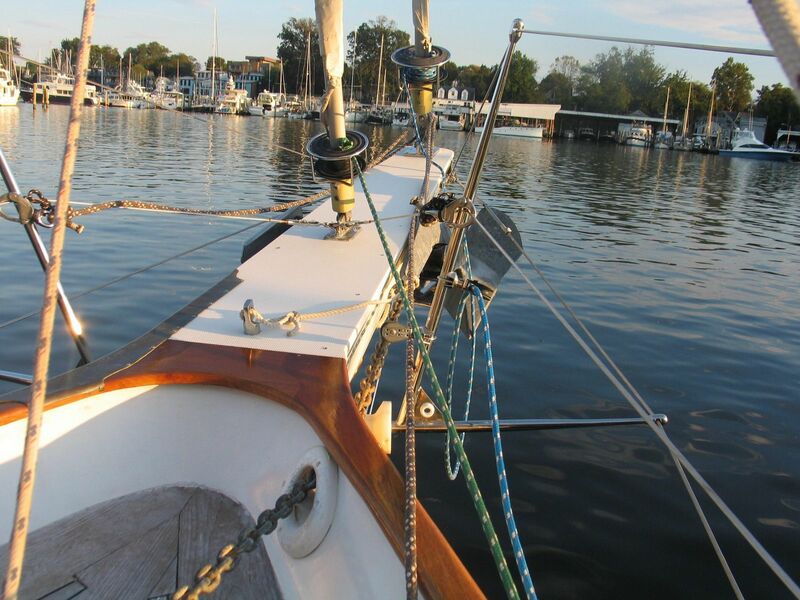 She is so easy to handle with just a couple or even sail singlehanded. The hull shape is sea kindly with an easy, comfortable motion. 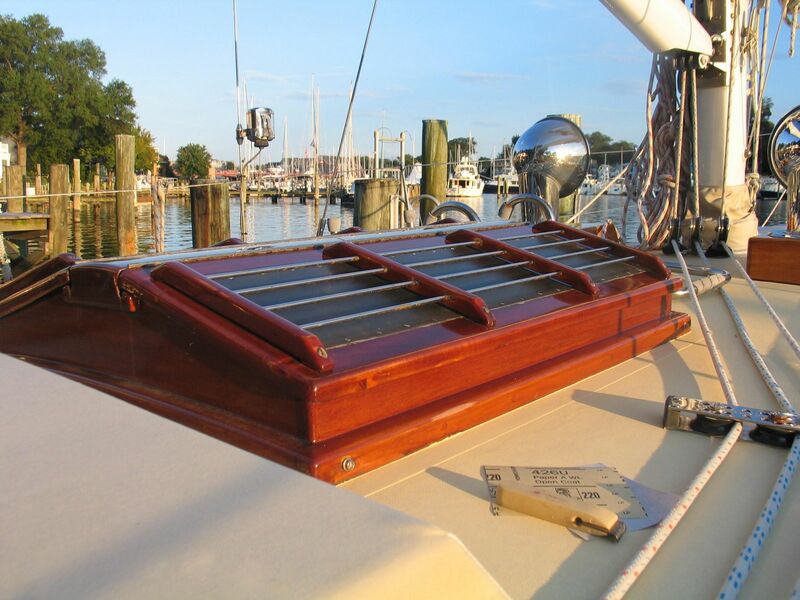 The shoal draft Scheel keel provides perfect sailing in the Chesapeake Bay, Bahamas and even the West Coast of Florida. 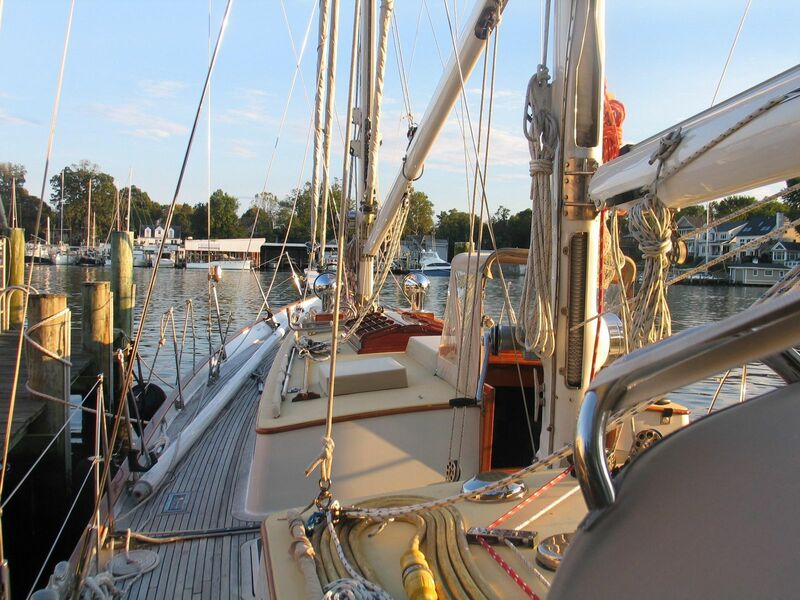 The tall, divided schooner rig makes for easy sail handling with two self tacking mainsails and roller furled Yankee headsail. The divided sail plan offers so many configurations that it is easy to set just the right amount of sail for everything from a lightest breeze to a gale. 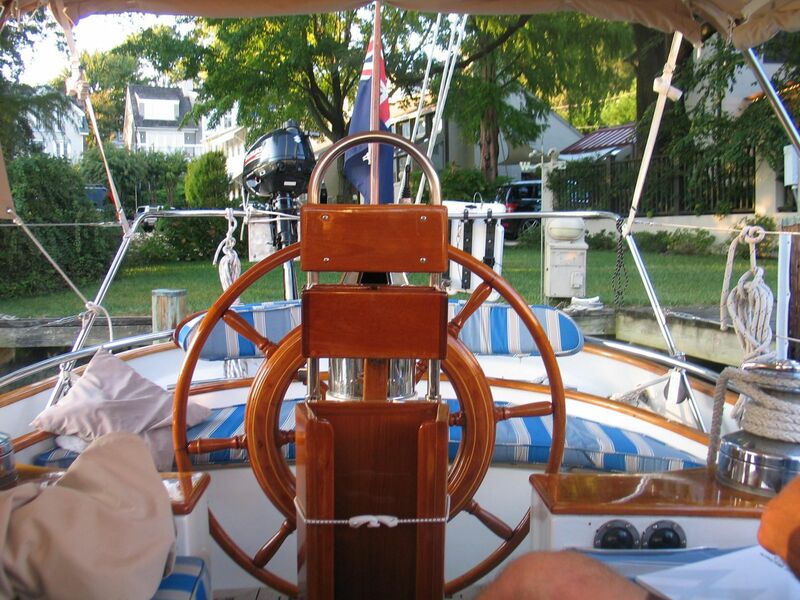 The schooner is easily sailed by a couple and she is the ultimate passage-maker at home on the ocean. 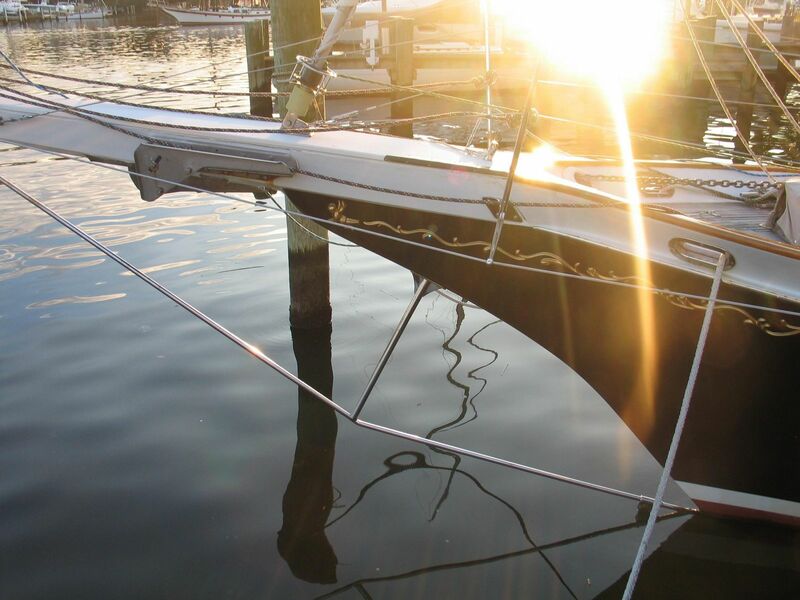 She is heavy and safe and will heave-to sweetly with just a deeply reefed foresail. And when you sail in to any harbor all heads will turn your way to admire her stunning good looks. Admire her, you will as she is maintained to exquisite perfection. 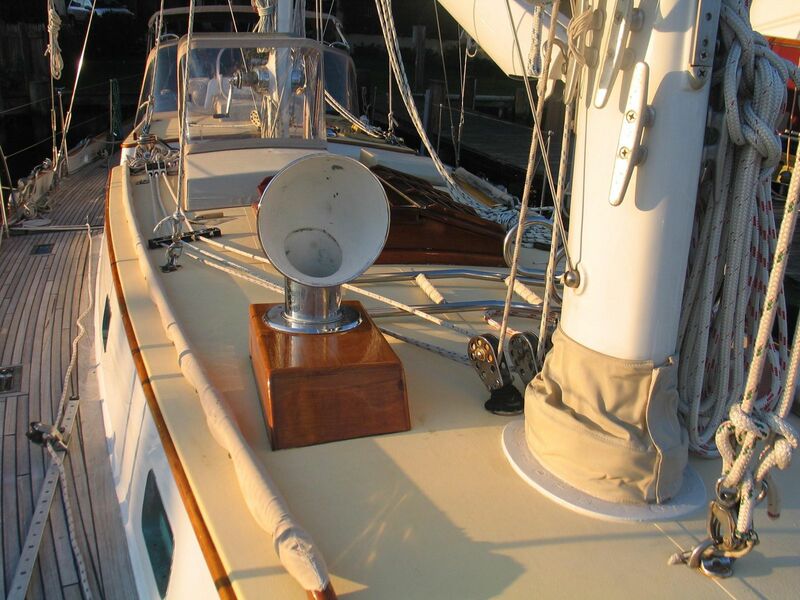 Each year during the four or five non sailing months Principles has been indulged with all necessary maintenance and all the upgrades to the whim of the owner who loves her quite dearly. He said if he had a dollar for everyone who had admired her, he’d be a wealthy man. New standing rigging all new rod rigging! 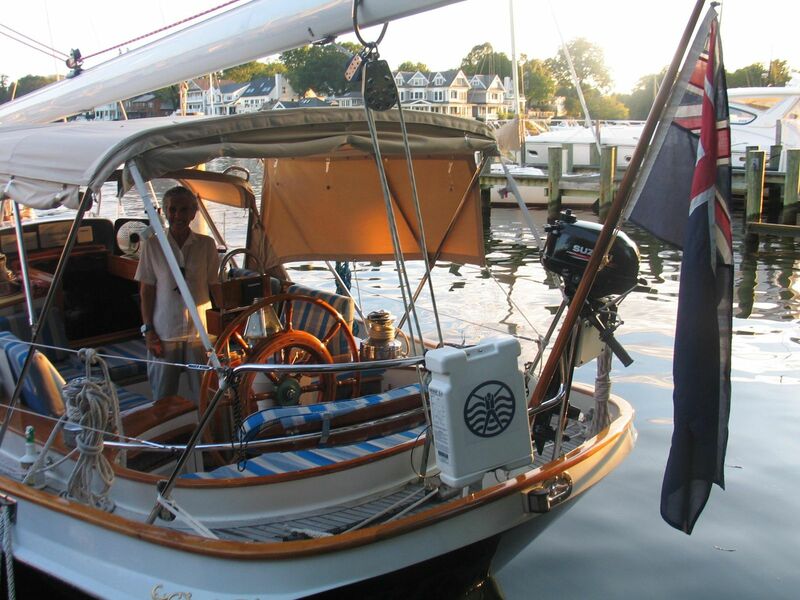 The Cherubini 48 Staysail Schooner is a timeless beauty. She is lovely in every sense of the word. She is as beautiful below decks as she is above. The gorgeous Mahogany joinery is made even more sumptuous with classic hardware and signature caning on the locker doors. Cherubini is well recognized for exquisite details and beautiful workmanship. The salon is lovely with six headroom and white wood panels and mahogany deck beams. To a person, everyone who has come aboard has said she is beyond lovely. 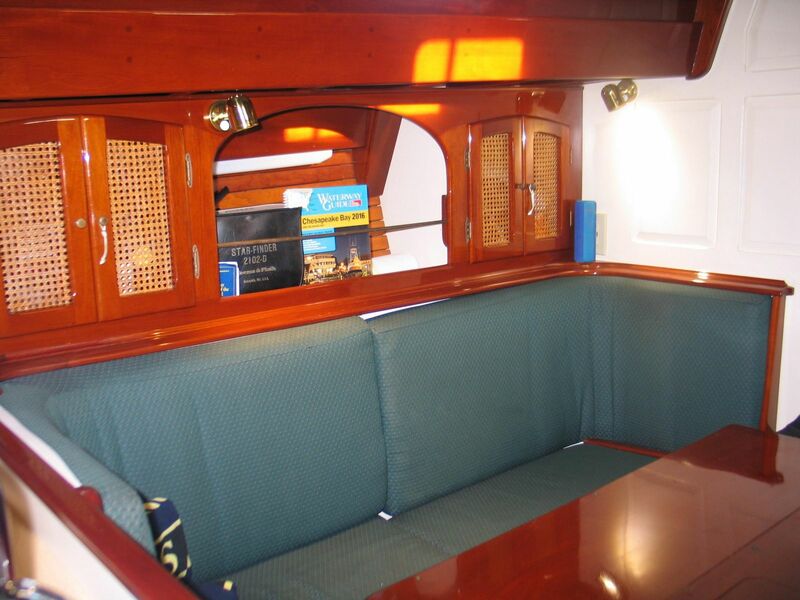 The layout is especially perfect for a cruising couple providing space for captain also. There are two companionways as is expected for a sailing schooner. 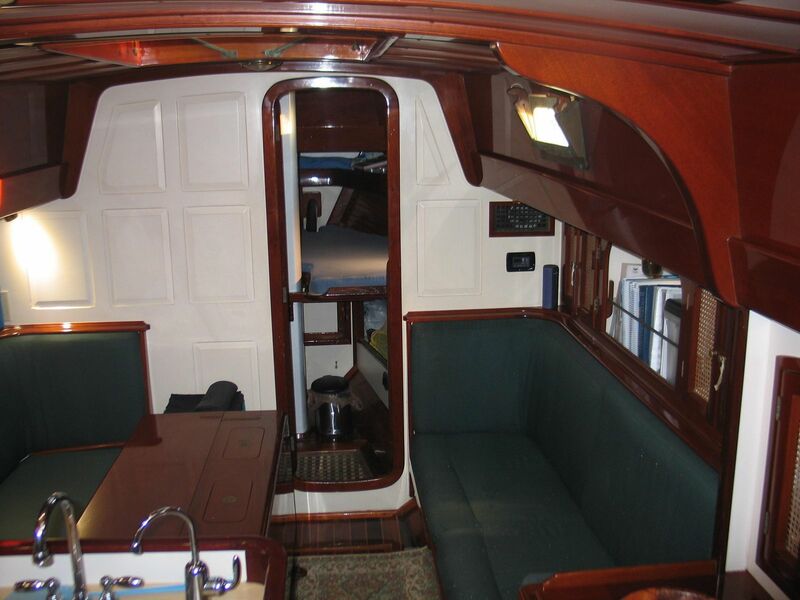 The main saloon has a companianway from the deck and the aft cockpit has a companionway that enters the aft cabin and navigation area. This classic layout offers many advantages. 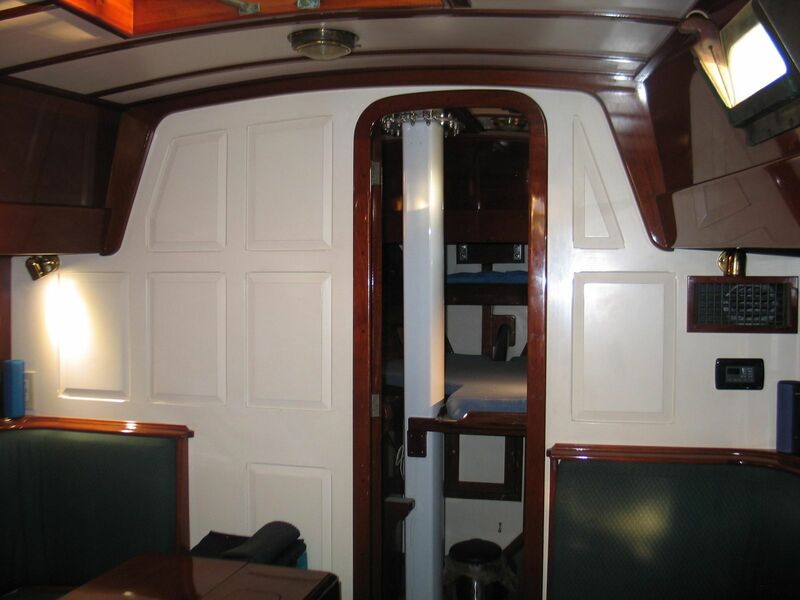 Main saloon is classic and traditional with a large drop leaf table with settees on port and starboard. Outboard there are beautiful mahogany cabinets and bookshelves. Of course there is storage behind and also under the settees. 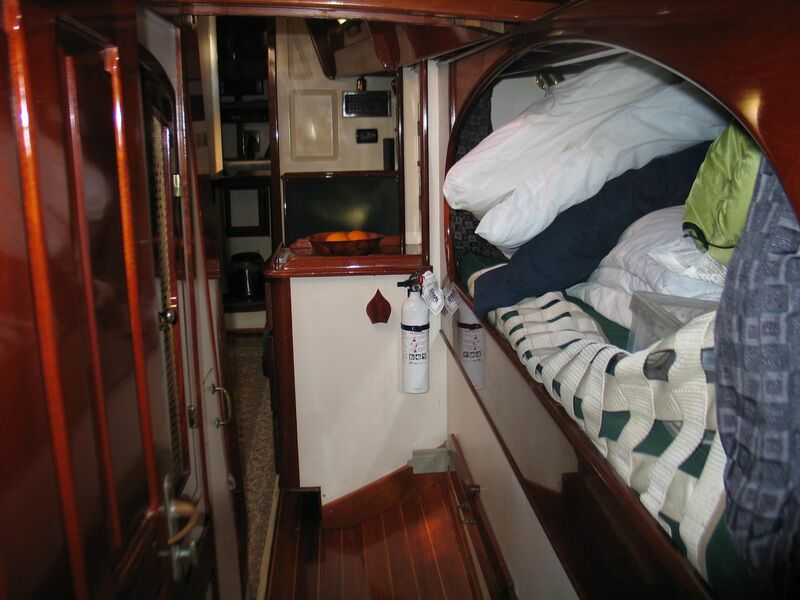 Just aft to port the galley is on is fitted with a Force 10 ceramic cooker as well as a small convection oven. 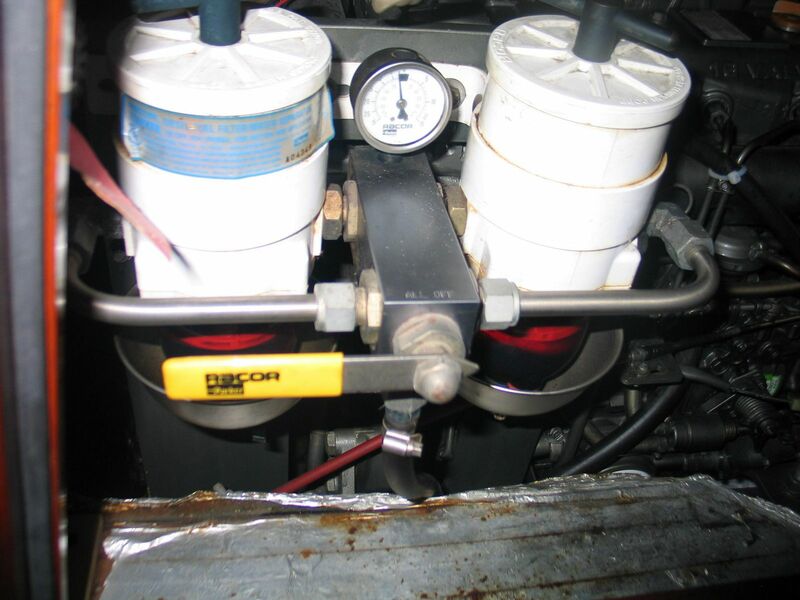 The 24volt system powers the stove. There are plenty of drawers and also sliding door lockers. 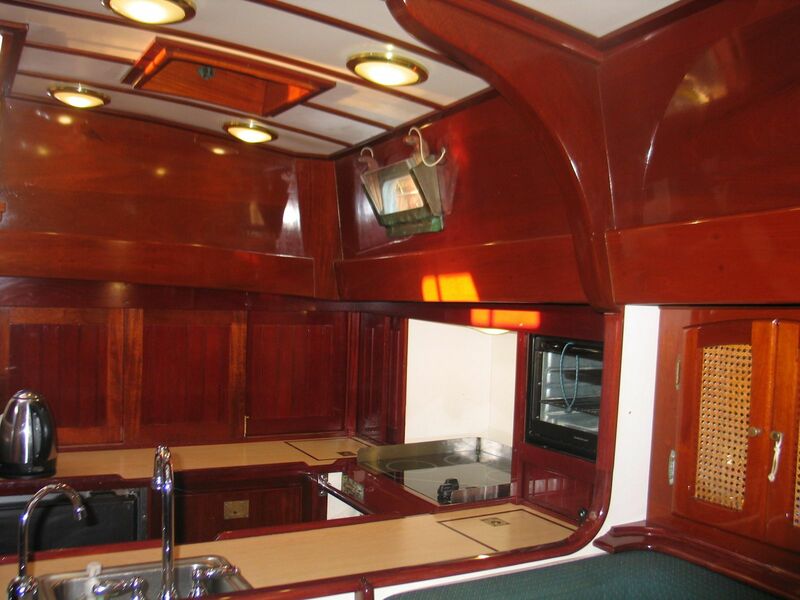 On the starboard side there is a built in refrigerator and freezer. 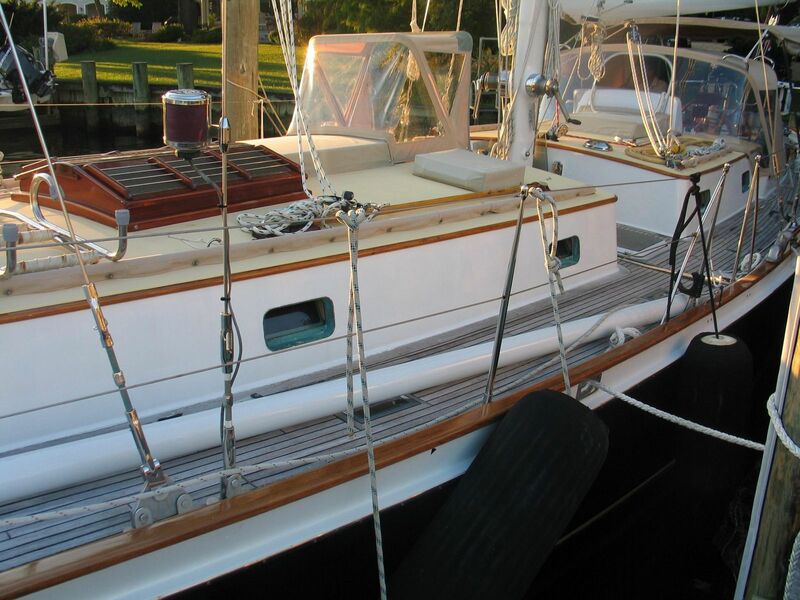 The walkway on the starboard side of the companionway leads through to the aft cabin. 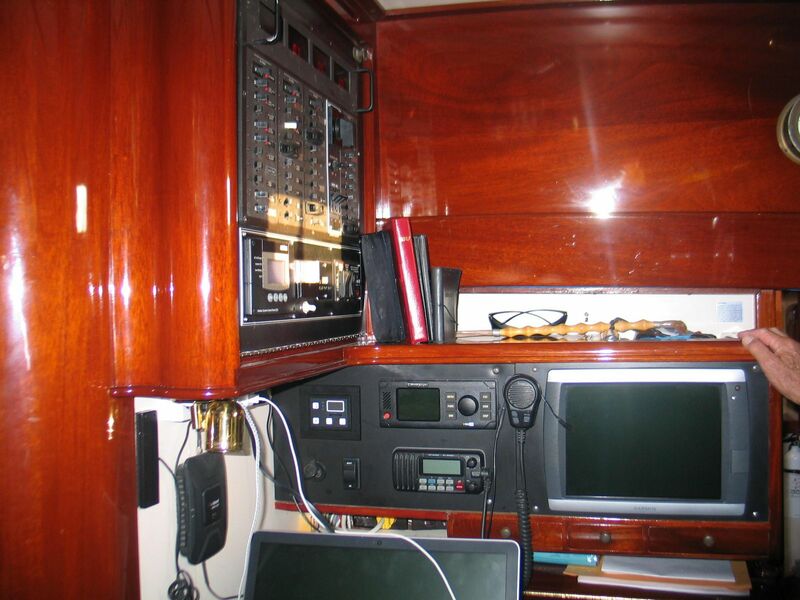 There is a good pilot berth outboard in the wall through. 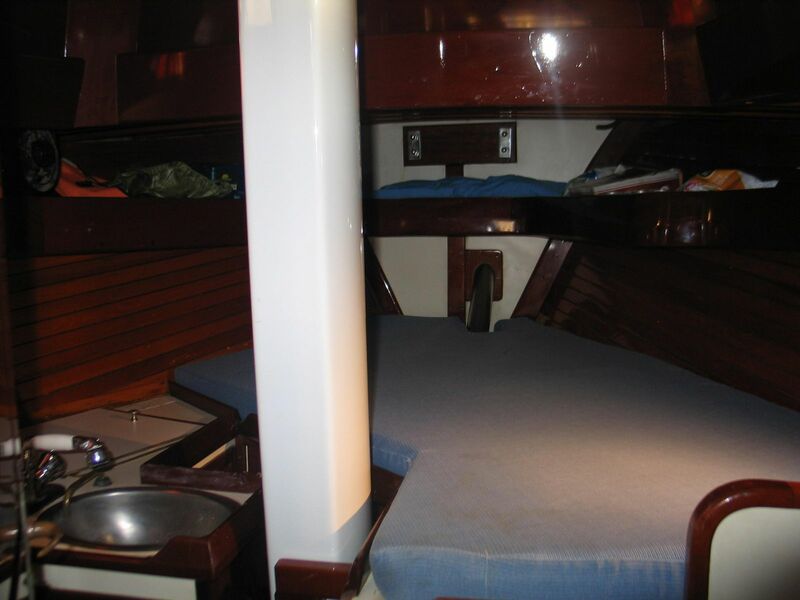 The aft stateroom is of a good size with many features. Starting from forward, there is a workbench with chest of drawers under. There is a hanging locker and a nice little sofa with lockers above and behind. 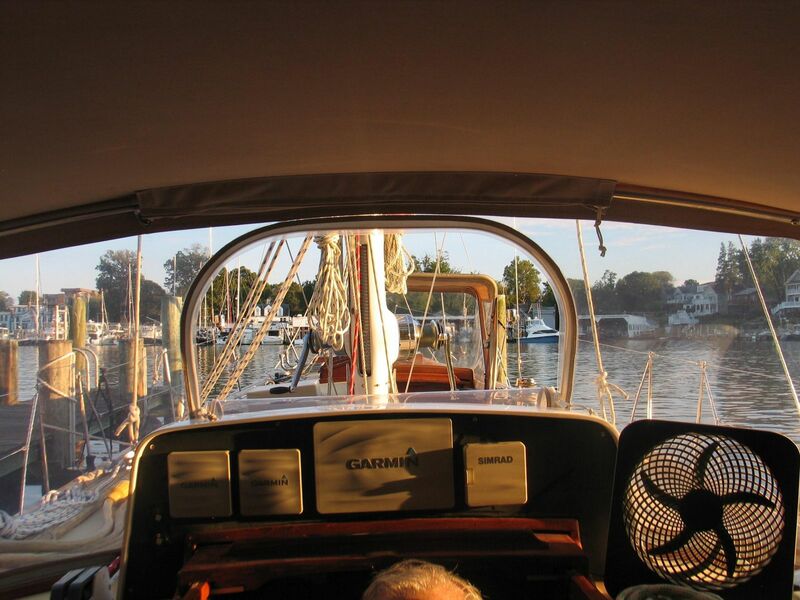 The aft companionway leads up into the cockpit and helm station. 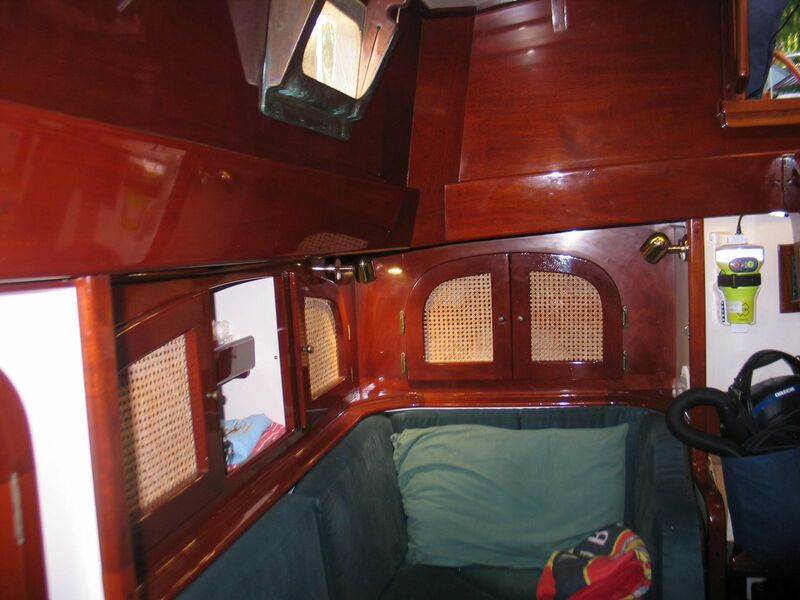 Between the companionway and the port side of the hull is a nice double berth then a hanging locker. Forward of that is the head with an electric toilet, Mira shower and vanity with a wash basin. 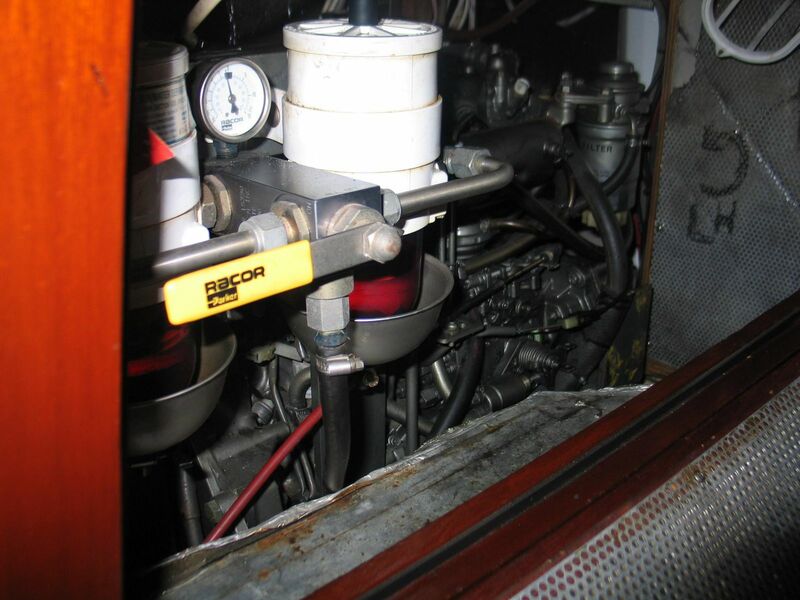 A door at the forward end of the head provides access to a service room with generator and large water heater. Up forward, there is a rather unique guest cabin or captain’s quarters has a nice berth with a wash basin with pull out shower and manual toilet and privacy. Downwind pole carbon fiber mounted on the power foredeck against stanchions used once in 2016 GCBSR for 3rd place! Barient winches upgraded with strategic Anderson Electric! Two spinnakers – 1.5oz and ¾ oz overhauled by supersailmakers in 2017! Other sails include a lightweight fisherman, fisherman, and collywobbles! 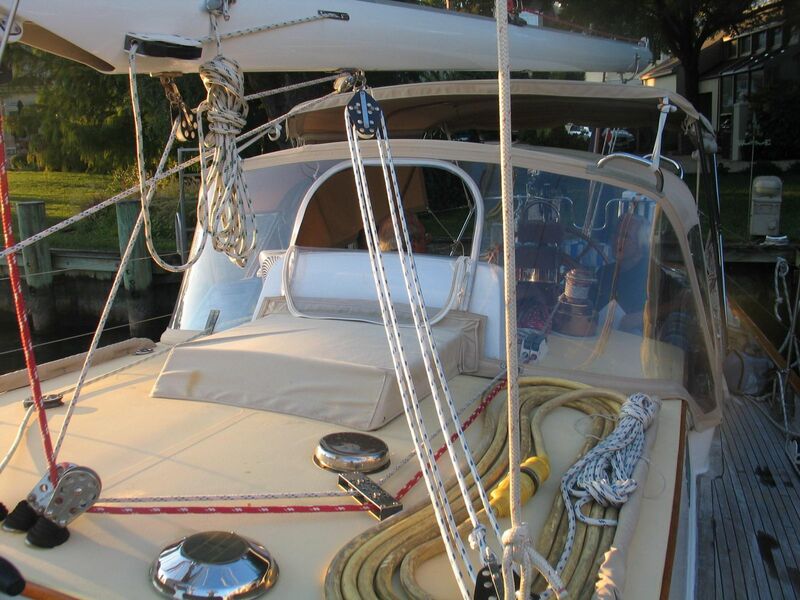 Cherubini Yachts is well regarded for high quality modern construction with traditional schooner design. 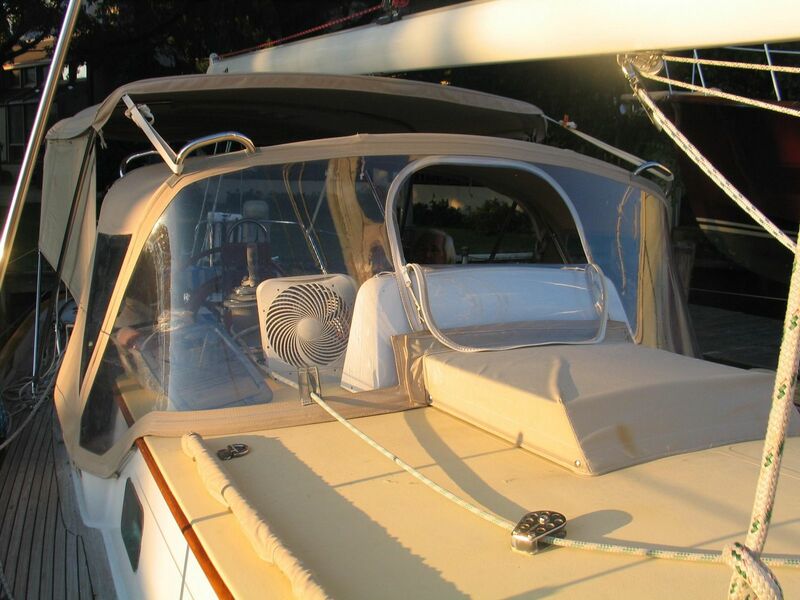 The hull is solid hand laid fiberglass with a fiberglass sandwich deck. All of the structural bulkheads are glassed both to the hull and deck. 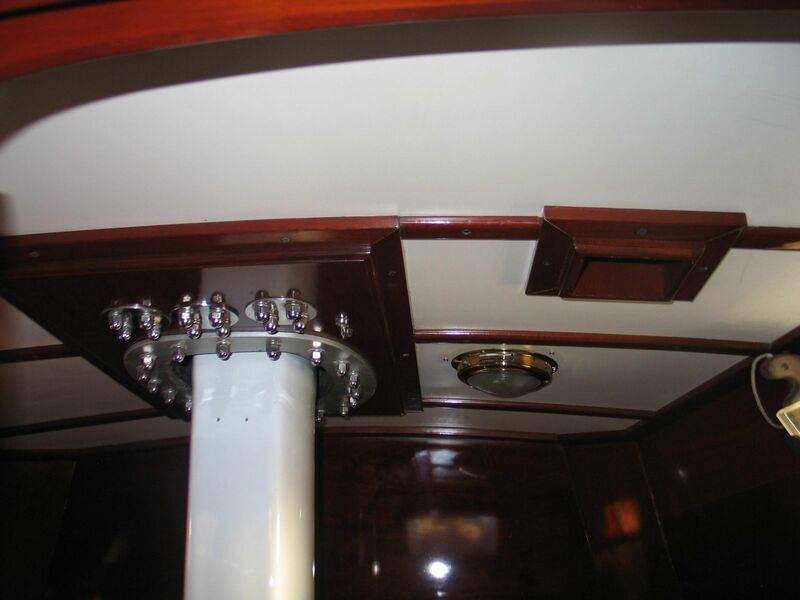 All the furniture is built into and tabbed into the hull sides for additional strength. The robust build and classic design provides speed, safety and comfort. Newly Awl gripped topsides of Flag Blue with a double boot stripe in red. Lovely transom with the name plate in real gold leaf! Aft cockpit is a beautiful t-shape with sumptuous curves!